3 Invitation to join a translating team. Invitation to join a translating team. You are invited to join a team that will be attempting to translate the unknown language on the Word Wall in the 6th Chapter of the Black Book Waking Dreams, the Word Wall that gives the third word ( D3V ) of the Dragon Aspect shout. There are strange, moving words behind the Dragon Language text on the Wall, written in an unrecognisable language. The Dragon Language part of the Word Wall has already been translated. It is the moving words in the unrecognisable language that this project hopes to translate. This project will be happening in my sandbox, which is open to collaboration by invited team members. The talk page of the sandbox is open to other contributors as well. I hope to see you get involved in the project. I have hand-picked you because you may have previously been involved in Elder Scrolls language translations in the past on the wiki, particularly if you worked on the Magic Script Alphabet or the Elder Alphabet pages. Arena description: "These undead are dangerous indeed, for they carry with them the curse of their deaths. Those who are struck by a zombie have a chance of getting a rotting disease, which will slowly but surely eat away at their health, eventually turning the hapless victim into a zombie also." Its not a theory I've heard before. The problem is - if we accept that various races of Mer constructed their own Towers (so that they might ascend following Auri-El's example), then Snow Throat can only be attributed to the Snow Elves of Skyrim. Following this thread, the Snow Elves would have required access to its Stone. All this would have occurred in the Merethic Era, before Shalidor built Labyrinthian and hid Glamoril there. Blackreach - Difficult to connect it to Snow Throat but there is a lot going on down there. Elder Scrolls, Dwemer, Aetherium etc. The cave in Shor son of Shor - A cave that Shor used to enter the Underworld. He was supposedly born is a cave. Again, not much to go on. Jung's Cave - A very obscure concept. Essentially comparing it to the tale in that the Elves saw their end goal: Tower Ascension, and built directly towards it, rather than following the path of Auri-El. Ironically in so doing, the Towers became inverted and dug down into Mundus and reinforced it, rather than reaching outwards and allowing the Elves to leave. "loses his throne" isn't the Oblivion Crisis - it's the death of Martin. "White Tower falls" isn't the sack of the tower during the Great War - it's the destruction of the Amulet, which is what caused White-Gold to deactivate. If we look at: "When the Snow Tower lies sundered, kingless, bleeding" - you have attached this metaphor to the Nordic people, but I would argue that its more a metaphor for Skyrim itself - which is an extension of Snow Throat. 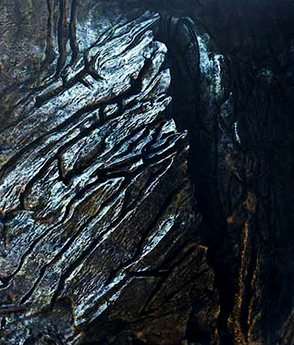 Alduin's Wall illustrates the "sundered" quite literally, as we see the mountain is clef in two. 5 of the 9 places visited for the main quest in Arena are known to have some association with the Towers. Four of them are the physical echoes, and the Halls of Colossus is where Tiber had Numidium remade. And remaining places may hypothetically have had roles which we just don't know about yet. The mysterious ruins of Labyrinthian do go back to the Merethic Era. Shalidor just built his maze there in the First. It's also possible the Chantry of Auri-El is involved. It's basically a "cave", since it's accessed via a cave. Shalidor is said to have stolen the Secret of Life from Akatosh (Akatosh, Auri-El, not much difference). So he may have transferred the Stone somehow from one to the other. Shalidor is said to have hidden the secret in his Labyrinth. And none of this rules out on or the other being the cave referred to in Shor, son of Shor. There would clearly be plot twists in this story I'm not aware of, but I think the story of Green-Sap demonstrates that a Tower's story can become rather convoluted. So who's to say that the Eye of Magnus, for example, is not a part of this story somehow? Ok, if you are referring to Bromjunaar, then yes we can say Merethic - but it was built by the Atmorans who were not involved in the creation of the Tower (in fact, it's the inverse - men were created on Snow Throat, if you believe Nord myth). Before them, we can only guess if the area held any significance to the Snow Elves. Shalidor transferring the Stone from one to the other may be a possibility, it was done with the Numidium (Red Heart --> Mantella) - but this is where the plot twist comes in. Ha! Now that is an interesting theory and a fairly decent explanation. Although I'm still a fan of "I breathe now, in royalty, and reshape this land...", this will do. Thanks! Is this the dialogue you are referring to, or is there more? If it is, I am a bit confused because I don't see it as supporting a wide general statement such as yours. In this case, perhaps we could rephrase it to something like "A form of Mysticism was probably used by some Reachman shamans during the Second Era"? Would you agree? If you are referring to a different dialogue, however, could you please tell me more about it? This page has been semi-protected. The main overview page on TIL seems to go by the province names as the main heading, as opposed to a race/faction heading. Also, the individual pages on TIL have the province names as the main title - this was my main reason to use the province name as the heading. I think Hargrimm and Alarra own the guide, so maybe we can ask them to clear this up? Yeah, I can add pre-release tags on the Wrothgar and Murkmire books. The most important thing is to keep a careful record of what's being created and where, in case we need to remove anything later - and I think my sandbox is doing that job. It's a small risk, but nothing that can't be handled. I think you are doing a great job in going through books and fixing links. I am not sure you have noticed, but during your work I see you link author names of books to Books by Author for quite a few authors and their books that are not yet on that page. This page was last modified on 29 July 2018, at 21:57.